Mary Ann Kreitzer shared a checklist for tomorrow Respect Life Sunday here. Tomorrow is Respect Life Sunday in the Catholic Church and a good time to reflect on what you will do to help end abortion. Prayer and fasting always provide the foundation, but where to go from there? 1) Participate in the Life Chain tomorrow. 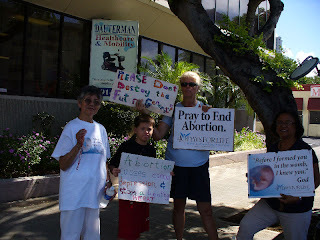 2) Spend at least one day at a 40 Days for Life prayer vigil. 3) Give a donation to a crisis pregnancy center. 4) Share your pro-life values with someone to whom you've never mentioned it. 5) Wear the little feet pin on your lapel and be prepared to explain why. 6) Spend time with your children or grandchildren reading them a pro-life book like Angel in the Waters. 8) Write a letter to the editor supporting the right to life of the unborn or the conscience rights of medical personnel not to participate in abortions. 9) Visit a nursing home and make friends with someone who gets no visitors. 10) Vote pro-life. Support for murdering the innocent is a disqualifying issue. No politician who supports killing the weak and helpless should get your vote - EVER. 12) Have Masses said for the intention of ending assaults against life. 13) Encourage parents of big families; they get plenty of criticism from the worldly. - An Italian-American, who lived in California, sometimes entrusted his Guardian Angel to report some messages to Padre Pio. Once, after the confession, he asked Padre Pio “if he really had received his messages from his Guardian Angel?” Father Pio asked him: “What do you think? Do you think I am hard of hearing?” After that Padre Pio repeated the messages that were sent him some days before by his Guardian Angel. - A Father Lino said: “I was begging my Guardian Angel to bring padre Pio a request of prayer for a lady who was very sick, but it seemed that nothing changed. When I met Padre Pio I told him: “Father, I begged my Guardian Angel in order to bring you a request of prayer for a woman who is very sick...is it possible he didn’t do it? And Padre Pio answered: “Do you believe your Guardian Angel to be disobedient as you and me? - A Father Eusebio said: I was going to London by plane, against Padre Pio’s suggestion not to use this mean of transport. When we were flying over the Channel, a violent storm put the aeroplane in danger. 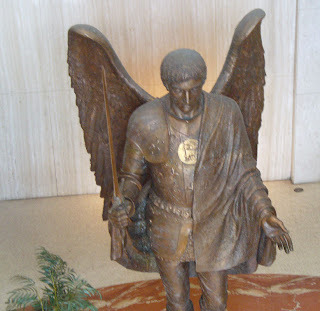 Amid the general terror I prayed and, without knowing what to do, I sent my Guardian Angel to Padre Pio. When I went back to St. Giovanni Rotondo I met Padre Pio who said to me, “Are you well? Is everything OK?” I answered; “I thought I’d die,” the saintly padre responded, “then why don't you obey? I responded “But I have sent you my Guardian Angel... Padre Pio then said, “Fortunately he arrived just in time!“. - One of Padre Pio’s spiritual daughters was walking along a country road to the Convent. There Padre Pio was waiting for her. It was one of those winter days, bleached by the snow in which it was even difficult to walk. The road was so full of snow that the woman had the certainty she would not reach the Convent in time for the appointment with the director. Full of faith, she charged his Guardian Angel to tell Padre Pio she would have arrived at the convent late because of the snow. When she reached the convent she saw with enormous joy that the monk was waiting for her behind a window. He greeted her smiling. - A man told: “Padre Pio often, stopped in the sacristy greeting his spiritual children and friends by kissing them. I looked with holy envy on those so fortunate and I thought: “Blessed him! If I were him! Blessed! Blessed him! On Christmas 1958, I knelt, in front of Padre Pio for confession. Afterwards, I looked at him and while full of emotion I asked him: “Father, today is the Christmas day, can I wish you Merry Christmas by giving you a kiss? And he, with a sweetness that I am not able to describe with the pen, smile at me and said: “Hurry up, my child, don't make me waste time“! He also embraced me. I kissed him and as a bird, joyful, I went toward the exit full of celestial delights. And what can I say about some slaps on the head? Every time, before leaving from St. Giovanni Rotondo, I desired father Pio gave me a sign of particular predilection. In fact I also wanted two small slaps on the head as two fatherly caresses. I have to underline that he never refused me anything I wanted to receive from him. One day, there were a lot of people in the sacristy of the small church and father Vincenzo exhorted, with his usual severity: “don’t push, don’t shake Padre Pio’s hands go back“! I sadly thought: “This time I will leave without having the blows on the head.” I didn’t want to resign me and I begged my Guardian Angel to become a messenger and to repeat these words to Padre Pio: “Father I desire the benediction and the two blows on the head, as usual, one for me and the other for my wife”. Padre Vincenzo was still repeating “don’t push Padre Pio...stay far from him!” when Padre Pio started walking. I was in anxiety. I looked at him but I was sad. Suddenly Padre Pio came to me, he smiled and he gave me two taps and it made me also kiss his hand, “I would like to give you a lot of slaps...a lot of slaps, “ he told me the first time that I asked him for the small slaps. - A woman was sitting in the square of the church of the capuchins. The Church was closed. 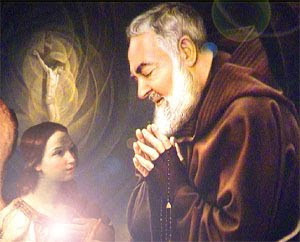 It was Late and she prayed with the thought, and she repeated with the heart: “Padre Pio, help me! Guardian Angel, please, go to tell father Pio to help me, otherwise my sister will die“! 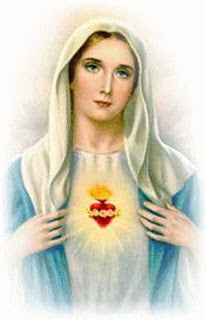 From the window above her Padre Pio’s voice came: “Who is calling me at this time? What is the problem? The woman told about her sister’s illness. Padre Pio went in bilocation, to the sick woman and healed her. 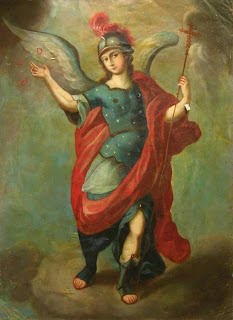 - Father Pio said to a person: "We will pray for your mother, so that the Guardian Angel will be with her in company." - One of the spiritual children of Padre Pio said: “ It seems that Padre Pio always listens to everybody who calls him.” One evening, a group of friends arrived to St. Giovanni Rotondo. They summarized the graces that they would have asked of Padre Pio, and they asked their Guardian Angels to bring their request to Padre Pio as soon as possible. The next day, after the Holy Mass, Padre Pio reproached them: “You do not leave me in peace even at night!” Watching Padre Pio’s smile they understood their prayer had been accepted. - Don’t write to me because I cannot answer you. Send me your Guardian Angel and I will do everything. - Your Guardian Angel has reported to me some sentences that have made me understand your mistrust. 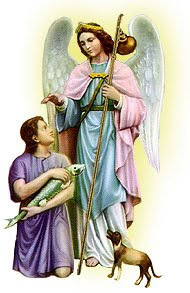 - Invoke your Guardian Angel that he will illuminate you and will guide you. God has given him to you for this reason. Therefore use him! - If the mission of our Guardian Angel is a great mission, the mission of mine is for sure greater than the others, because he has to be a teacher and explain to me other languages. - Send me your Guardian Angel - he doesn’t have to pay a ticket for the train and he doesn’t wear out his shoes. - For people that live alone there is the Guardian Angel. and instruct me when I err in my judgment. -New Saint Joseph People's Prayer Book, Catholic Book Publishing. In what period of history have children, especially those waiting to be born, faced such tremendous threats to their lives? How is it possible that almost 2 billion children have been killed by surgical abortion worldwide since 1960 and the response of even pro-life people is so muted? Today there are countries like Russia where 52% of pregnancies end in abortion. Evil on this gigantic scale has to have a satanic origin, and St. Michael is the one who first defeated the Devil's plans. 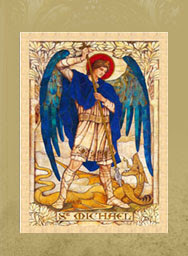 Please join HLI in our prayer campaign to St. Michael the Archangel using the powerful prayer first given to the Church by Pope Leo XIII. The response so far has been extraordinary. We have had to print over 2.5 million prayer cards just to keep up with the requests from our website. 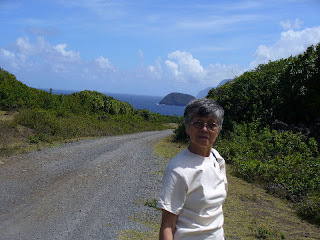 Thanks to my hardworking and generous husband, my mom and I were able to take a day trip to Molokai yesterday. We met our pilot and the rest of the passengers early in the morning. We were a little late in taking off because of the concern on the overall weight. But thanks to a little sacrifice on everyone's part, all of us were able to fly over to Kalaupapa. Our pilot could not have been nicer or friendlier. He was also a gentleman. I highly recommend Big Island Dave of Iolani Air if you ever want to fly to another island. Our fellow passengers were great! There was a couple from New Zealand. They were friendly and just plain nice. They were also good-natured considering the teasing the had to endure by our playful pilot. There was also a fellow from South Jersey who was a pilot himself. Then there was a couple from Belgium. 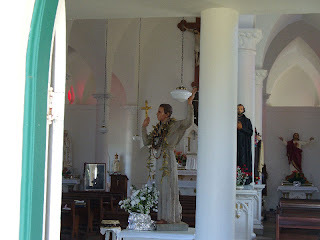 The husband spoke English and he patiently answered our numerous questions about Father Damien and his home town of Tremeloo. Apparently, out of all the celebrities, sports heroes, etc. in Belgium, a recent poll results came in that Father Damien was the most important and famous person in Belgium. This couple also had a newspaper clipping of a Belgium paper with an article on Father Felix Vandebroek, the pastor of St. Francis on Kalaupapa. Fr. Felix is also from Belgium. Well, because we were late, we missed our tour bus. Only in Hawaii can a pilot land the plane, run over to get a pick up truck, get the passengers on the pick up truck and then drive the passengers over to meet the tour bus. Well that is exactly what Big Island Dave did for us. Just up the road we saw our tour bus. The tour guide Norman (same one who showed us around last year) and the hikers we were joining, warmly greeted us. Someone explained that we had to leave our water bottles behind (because of the weight concern) Norman drove around looking for someone to open the store for us. Then we took the following tour. Since most of the residents were getting read to leave for the canonization pilgrimage, no one was available. Norman did make a final stop and found water bottles for us. What a nice gesture! I must say everyone was nice. The hikers offered to share their water with us too. 5th stop: Blessed Damien's gravesite and St. Philomena's Church (Unfortunately it was again off limits to us because of the newly refinished flooring). As usual, we did not want the day to end. It was an incredible feeling to be able to walk were a holy man had walked. Even though the sights were magnificent to us, I tried to imagine the horror the people brought over must have felt because of the sense of imprisonment and banishment through no fault of their own. 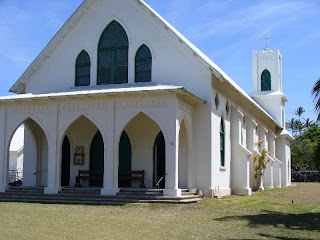 They were however, blessed to have Father Damien there and eventually, that forbidden place became a sacred place of love and security for its inhabitants. And next Sunday, Father Damien (Joseph) de Veuster of Belgium, will be canonized a saint in the Catholic Church. Something that most of us already knew. "Ah! 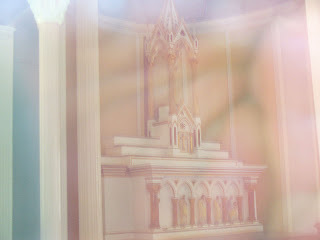 my Jesus, pardon me if I am unreasonable in wishing to express my desires and longings which reach even unto infinity. Pardon me and heal my soul by giving her what she longs for so much! 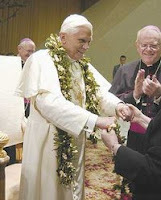 To be your Spouse, to be a Carmelite, and by my union with you to be the Mother of souls, should not this suffice me? And yet it is not so. No doubt, these three privileges sum up my true vocation: Carmelite, Spouse, Mother, and yet I feel within me other vocations. I feel the vocation of THE WARRIOR, THE PRIEST, THE APOSTLE, THE DOCTOR, THE MARTYR. Finally, I feel the need and the desire of carrying out the most heroic deeds for you, O Jesus. I feel within my soul the courage of the Crusader, the Papal Guard, and I want to die on the field of battle in defense of the Church. I feel in me the vocation of the Priest. With what love, O Jesus, I would carry you in my hands when, at my voice, you would come down from heaven. And with what love would I give you to souls! But alas! while desiring to be a Priest, I admire and envy the humility of Saint Francis of Assisi and I feel the vocation of imitating him in refusing the sublime dignity of the Priesthood. O Jesus, my Love, my Life, how can I combine these contrasts? How can I realize the desires of my poor little soul? Ah! in spite of my littleness, I would like to enlighten souls as did the Prophets and the Doctors. I have the vocation of the Apostle, I would like to travel over the whole earth to preach your name and to plant your glorious cross on infidel soil. But O my Beloved, one mission alone would not be sufficient for me, I would want to preach the Gospel on all the five continents simultaneously and even to the most remote isles. I would be a missionary, not for a few years only but from the beginning of creation until the consummation of the ages. But above all, O my Beloved Savior, I would shed my blood for you even to the very last drop. 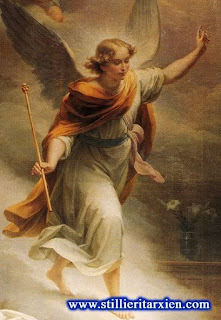 The Sacred Scriptures have revealed the proper names of only three Angels, all of whom belong to the Choir of the Archangels. The names are well known to all, namely: Michael, Gabriel, Raphael. Ancient apocryphal literature of the Old Testament contains several other names of Archangels in addition to the three just mentioned. Like the sources themselves, these other names are spurious. 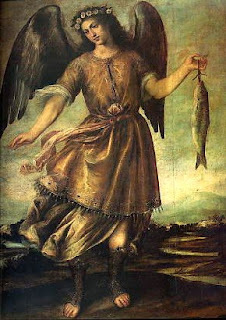 Names like Uriel, Raguel, Sariel, and Jeremiel are not found in the canonical books of Sacred Scripture, but in the apocryphal book of Enoch, fourth book of Esdras, and in rabbinical literature. The Church does not permit proper names of Angels that are not found in the canonical books of the Bible. All such names that were taken from apocryphal writings were rejected under Pope Zachary, in 745. There must have been danger of serious abuses in this regard during that century, because a similar step was taken in a synod held at Aix-la-Chapelle in 789.
a helmet for our head. is Your Word, O Lord. 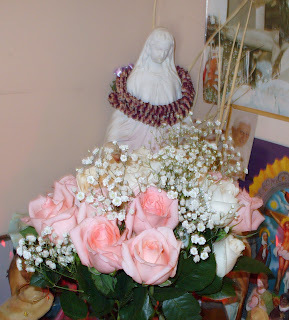 Novena can still be started today September 29th and end October 7th Feast of Our Lady of the Rosary. This novena is to be said along with a daily rosary. This morning a group of Catholic moms got together and held an hour vigil in front of Planned Parenthood. It was the first time for a couple of them. The plan was to pray the entire Holy Rosary during that hour. As you all know the old saying "If you want to make God laugh, tell Him your plans." We started with the Sorrowful mysteries and got up to the fifth mystery, the Crucifixion, when there was an accident. One of the young children with us fell and ended up with a bloody nose. The Rosary and vigil were put on hold while we tended to the injured child. The poor young mother was very apologetic but I hope we assured her that she had nothing to apologize for. As my mother pointed out later, the blood of an innocent child was spilled in front of Planned Parenthood. Very symbolic. 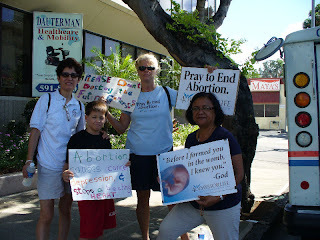 After the child was comforted, we finished praying the Holy Rosary and the Priests for Life Prayer that is prayed in front of an abortion mill. During this time a gentleman passed by us. As he past by me he handed me a bag of ice cold bottled water. I hope I thanked him enough for the water was a blessing on this hot and sunny day. Later we prayed a Hail Mary for his intentions. The young mom and her children left was following the prayer and we continued to pray the Divine Mercy Chaplet, silent prayer and then some hymns. Another gentleman approached us. He was an elderly Jewish man. He was asking us some questions about whether or not we were actually making a difference. He then shared that the government cut off his benefits because they did not consider him of any value. That made us sad. That hour went by quickly. We hope to do it regularly as a group during these 40 Days. I hope you can join us. Holy Princes and faithful messengers of the Sovereigns of Heaven, I thank thee for the lights with which thou hast illuminated my understanding and strengthened by heart and dissipated the blindness of my eyes. I, who am the least of all of the creatures that exist upon the earth, praise the Lord for all of the marvelous things He has done in me. 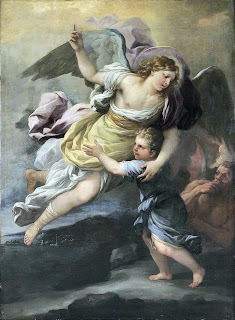 Dear Archangels, I, who am deserving of nothing, beseech thee, go now to Our Lord and Our Lady of Good Success and intercede for me, as this poor servant desires to prostrate himself before Them and submit to whatever they desire. As my heart and my entire being belongs to Them, may I, like a small drop of dew, lose myself in the immensity of the Divine Being.